← LA CUEVA DE HÉRCULES, TRES CUEVAS. EN LA PRIMERA, OCULTA, YACEN LOS REGIOS RESTOS MORTALES DEL REY VISIGODO RODRIGO Y SU CORCEL ORELIA. In the Conti Chapel at Poli in Latium, there resides the remains of a thirteenth-century mosaic, that formerly adorned the apse of the old Basilica of St. Peter in Rome. [Bovini (1966) 23-4.] 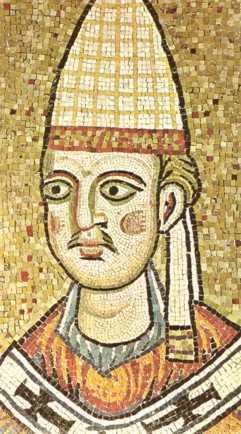 The mosaic was restored by Innocent during his pontificate, and one fragment that has survived, depicts him with blond hair and a fair complexion. Unfortunately, the racial import of this artwork is marred somewhat by its relatively crude nature. However, a more valuable contemporary depiction of Innocent can be found in the Church of Sacro Speco at Subiaco. A thirteenth-century fresco of Innocent can be found there, which portrays him in great detail. [Maxwell-Stuart (1997) 101.] The fresco shows Innocent as an imposing figure, with a long face, narrow nose, and a lantern jaw. His complexion is pale, but ruddy in the cheeks; his hair is dark-blond, though shot through with light-blond highlights; his eyes are dark-blue in colour. 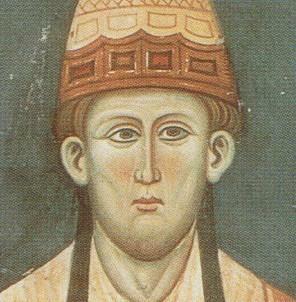 It may be deduced from all of the foregoing evidence, that Innocent III was predominantly Nordish. Bovini, G. (1966) The Basilica of St. Peter, Rome (Bologna: Resto del Carlino). Dunan, M. (1968) Larousse Encyclopedia of Ancient and Medieval History (Feltham: Paul Hamlyn). Maxwell-Stuart, P. G. (1997) Chronicle of the Popes (London: Thames & Hudson). During the course of my investigations into Nordic racial history, I have gathered together some rather interesting material on the presence of the Nordic race in the Classical World. Of particular value, are the researches of J. L. Angel, who performed an extensive survey of all ancient Greek crania. Angel analysed these skulls from a typological perspective, and because of the position he took on the reality of race, he was subsequently much criticised by his contemporaries. We may note that Angel (1944), calculated that during the Classical period of Greek history (650—150 BC), 27% of the Greek population had been predominantly Nordic in type. He observed that prior to the Classical period, the Nordic element had been larger, and that after it, the element in question had declined. [Angel (1943; 1944; 1945; 1946a, b, c.] Angel (1971), also noted that the immigrant Indo-Europeans, were of Nordic subrace. Peterson (1974), studied portrait busts of famous ancient Greek personages, and concluded that the aristocracies of Hellas were a product of closely interbreeding, Eupatrid clans. These clans were mostly Nordic in type, being largely descended from the Indo-European invaders. The demos, or common people however, as well as most slaves, were of Mediterranean, Pelasgian descent. 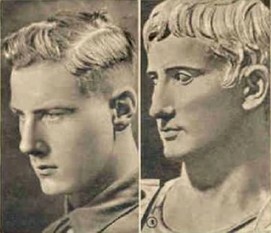 The study of Greek literature which Sieglin (1935) performed, has demonstrated that many individuals in the elites of ancient Greece, had blond or red hair. For instance, Alcibiades, Alexander the Great, Critias, Demetrius of Phalerum, King Lysimachus, Ptolemy II Philadelphus and King Pyrrhus, were all fair-haired individuals. Dionysius I, the ruler of Syracuse, had blond hair and freckles, whilst the Athenian playwright Euripides, also had a fair and freckled complexion. [Günther (1956).] Some critics have attempted to claim that the Greek word “ksanthos” (xanthos), means “brown-haired”, rather than “blond-haired”. However, a recent article by Moonwomon (1994), on colour-meaning in ancient Greek, reveals that the word did in fact mean blond. For more literary descriptions of pigmentation in ancient Greek poetry and prose, as well as craniological evidence, I can recommend the following works: De Lapouge (1899), Jax (1933), Myres (1930), Reche (1936) and Ridgeway (1901). Günther’s works on the subject of Greek racial history (1927; 1928; 1929a, b; 1956; 1961), are particularly valuable. Günther performed a detailed analysis of Greek history, from a biological perspective. Utilising craniological, literary, and pictorial evidence, he reconstructed the racial structure of ancient Greece. He concluded that the Nordic subrace formed something of an ideal for the Greeks, and that the Nordic element was more influential than any other. At the summit of its achievements, Greece possessed a large Nordic element, but as this element declined, so did Greek culture and civilisation. I do not personally believe that the Nordic racial element in ancient Greece was ever predominant, but I do think that it was concentrated in the elites, and that it therefore probably had a disproportionately large influence. It is easiest to study and trace the impact of this particular element, because of its distinctive pigmentation. Angel, J. L. (1971) Lerna: A Preclassical Site in the Argolid, Volume II — The People (Washington: Smithsonian Institution Press). Günther, H. F. K. (1928) Platon als Hüter des Lebens: Platons Zucht- und Erziehungsgedanken und deren Bedeutung für die Gegenwart (Munich: J. F. Lehmanns Verlag). Günther, H. F. K. (1956) Lebensgeschichte des hellenischen Volkes (Pähl: Verlag Hohe Warte). Jax, K. (1933) Die weibliche Schönheit in der griechischen Dichtung (Innsbruck: Universitäts-Verlag Wagner). Myres, J. L. (1930) Who Were the Greeks? (Berkeley: University of California Press). Ridgeway, W. (1901) The Early Age of Greece, Volume I (London: Cambridge University Press). Angel, J. L. (1943) “Ancient Cephallenians: The Population of a Mediterranean Island.” American Journal of Physical Anthropology, I, 229—260. Angel, J. L. (1944) “A Racial Analysis of the Ancient Greeks: An Essay on the Use of Morphological Types.” American Journal of Physical Anthropology, II, 329—376. Angel, J. L. (1945) “Skeletal Material From Attica.” Hesperia, XIV, 279—363. Angel, J. L. (1946a) “Race, Type, and Ethnic Group in Ancient Greece.” Human Biology, XVIII, 1—32. Angel, J. L. (1946b) “Skeletal Change in Ancient Greece.” American Journal of Physical Anthropology, IV, 69—97. 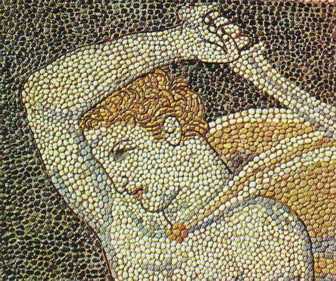 Angel, J. L. (1946c) “Social Biology of Greek Culture Growth.” American Anthropologist, XLVIII, 493—533. Günther, H. F. K. (1961) “Like a Greek God…. Translated by Vivian Bird from Professor Hans F. K. Guenther’s Rassenkunde des Hellenischen Volkes.” Northern World, VI (1), 5—16. Moonwomon, B. (1994) “Color Categorization in Early Greek.” Journal of Indo-European Studies, XXII, 37—65. Peterson, R. (1974) “The Greek Face.” Journal of Indo-European Studies, II, 385—406. Ridgeway, W. (1909) “The Relation of Anthropology to Classical Studies.” Journal of the Royal Anthropological Institute of Great Britain and Ireland, XXXIX, 10—25. As can clearly be seen from this, there was a predominance of fair characteristics, amongst the Roman ruling class. Of the 18 Emperors from Augustus to Commodus: 9 had blond or red hair; 5 had grey or white hair; 3 had no recorded hair colour, and just 1 (Hadrian), was referred to as dark-haired. Of the 18 Emperors from Augustus to Commodus: 9 had blue or grey eyes; 2 had “wine-coloured eyes” (whatever that may mean), and 7 had no recorded eye colour. Although several of the Emperors were white/grey-haired old men, we still possess information which depicts a few of them as light-eyed. If records had been made during their youth, it is likely that they would have been called fair-haired as well. Of the 9 Emperors who had fair hair, 5 are listed as also having light eyes, whilst the remaining 4 have no noted eye colour. Remarkably, only Hadrian is called dark-haired, but even then, he was still described as being light-eyed. Strangely enough, for whatever reason, we possess absolutely no description at all of the “philosopher Emperor” Marcus Aurelius. The precise meaning of “wine-coloured eyes” remains troublesome, and no completely satisfactory explanation of this term has ever been offered. Some scholars have suggested that it may mean “warm brown eyes,” but this is mere supposition on their part. [Day (2001) 105.] For the time being, we will treat this term neutrally. Therefore, with this notable exception, there seem to be no references to dark eyes. It is surprising how detailed and complete our records are concerning these facts, but there are some important lacunae in our knowledge, and we may offer some speculations as to why they occur. For instance, Tiberius’ hair colour does not appear to have been recorded. This may be due to the fact that he was largely bald by the time he became Emperor. [Scarre (1995) 28.] Similarly, Otho was fond of depilating himself, and often wore a wig, as Suetonius affirms. [Scarre (1995) 61.] Also, his reign was relatively brief, and thus there may not have been sufficient time for a record of his eye colour to be made. The fact that the records are comparatively complete, totally undermines the notion that the Emperors were brunet, like the majority of Romans during the Imperial Age, or that their pigmentation went unrecorded, because it could simply be assumed that they were dark-complexioned, and thus akin to the masses. This work is merely a fraction of the information that exists on this subject. Many of the Roman Emperors were also tall, fair-complexioned, etc., but this study at least offers some highly revealing facts. In conclusion, this data demonstrates a marked tendency towards light features among the Roman Patricians. Malalas = John Malalas, Chronographia. Pliny = Pliny the Elder, Naturalis Historia. Suetonius = Suetonius, De Vita Caesarum: Divus Iulius, Divus Augustus, Tiberius, Caligula, Divus Claudius, Nero, Galba, Otho, Vitellius, Divus Vespasianus, Titus, Domitianus. Day, J. V. (2001) Indo-European Origins (Washington, DC: Institute for the Study of Man). Jeffreys, E., M. Jeffreys & R. Scott (1986) The Chronicle of John Malalas (Melbourne: Australian Association for Byzantine Studies). Scarre, C. (1995) Chronicle of the Roman Emperors (London: Thames and Hudson). “Their facial type is not native to the Mediterranean basin, but is more at home in the north…. The French author Rochat, examined portraits of the ancient Romans, and concluded that the Roman type was essentially Nordic. [Günther (1957).] The Swiss physical anthropologist His (1866), after studying both sculptures and skulls, determined that the true Romans had been Nordic. It is interesting to note that the Romans thought that Aeneas, Romulus and Remus, as well as Roma, the goddess who symbolised the Eternal City itself, were all golden-haired individuals. It would seem that the Romans could only have thought that the mythical founders of their people were blond, if they were themselves an originally blond-haired nation. [Ogle (1929).] In his researches Günther (1927; 1929a, b; 1957), has examined in great detail, the racial history of the Romans, and has successfully demonstrated that the origins of Rome’s greatness lay in its Nordic racial elements. This essentially Nordic trend continued into the Early Modern Period. The Germanic invasions refreshed Italy’s Nordic stock, and in time gave birth to the Renaissance. It is significant that the Renaissance flowered in the north of Italy, where the Nordic element was strongest, and not in the predominantly Mediterranean south. Throughout the Renaissance period, the ideal of beauty was Nordic. Dante’s Beatrice, and Petrarch’s Laura, were both blondes. Botticelli’s and Titian’s paintings depicted the blonde woman as being the most beautiful. Even in modern Italy, during the period of the Risorgimento, many of the great politicians and artists were Nordic: Garibaldi had red hair, Cavour was blond, Canova had blue eyes, etc. [Woltmann (1905) 133—141.] If you are interested in this subject, and wish to know more about it, then I suggest that you also read the following works: Cogni (1937), De Lapouge (1899), Los (1968), Plumb (1961) and Reche (1936). Esta entrada fue publicada en ANTIRRACISMO, RACISMO Y CASTISMO, HISTORIA, MITO DE LA RAZA. Guarda el enlace permanente.